Its beautiful! Thank you so much Jackie! Tapestry of Truth does great work and this is one of many verses that we have from them in our home! We love this how this turned out! You did an amazing job hearing from our Lord and from me. This is the vision that God put into my heart sometime last year. It finished off the Jill jungle room perfectly! Thank you so much again for being a part of us passing on our Godly heritage. 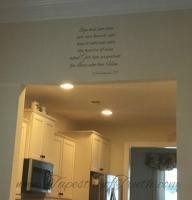 This decal was the perfect addition to our new laundry room! And it gives me a chuckle every time I read it :) We love Tapestry of Truth! Not only is their product top quality at great prices. Their hearts are in the right place! It's obvious that they love the Lord and want to glorify Him with their business. We wouldn't buy our wall lettering from any other company! We have this in our dining room. Great reminder every single day! Thank you, our wall looks wonderful!